When I picked up this book, I thought it looked like a charming story of the ups and downs of childhood. The front cover and the blurb on the back did not prepare me for the dark and intensely disturbing atmosphere of The Wild. When Francine, a single mother and her two children move in with the bohemian William and his three daughters, life seems great. They have healthy meals, sing songs and have plenty of outdoor space to roam around in. Nine year old Tess loves her new home, where she has her own plot of garden and gets to look after chickens. Her older brother Jake and their vicious but loyal cat, Odin, aren’t so happy with their new family. As life goes on and Francine and William become more involved, Tess slowly begins to realise that the new man in her mother’s life is not as perfect as he appears to be and that she will never be fully accepted into his family. Esther Freud captures the innocence of childhood through the character of Tess and the frustration of not being old enough to do what you want through the angry character of Jake. These siblings, alone in a house that is not their own, with a family in which they do not feel as though they belong, stick together and take comfort from each other and their cat. Having a brother of my own, I can fully understand the love-hate relationship of Tess and Jake. Of course they argue like any other brother and sister, but there are some very touching moments between them. I found this book hauntingly truthful. There are two broken families involved, with emotionally scarred parents and confused children, not knowing where their loyalties should lie. The Wild tackles the sensitive subject of childhood affected by separation, unstable parents and new adults in their lives. 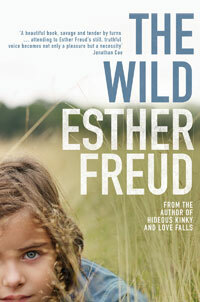 I cannot help but think that Esther Freud must have had some personal experience of this nature, as the disappointment and frustration of the characters oozes out of the pages, making it an uncomfortable and emotional book to read. It may be unsettling , but the fact that The Wild can induce such emotions shows what a powerful and important book it is.